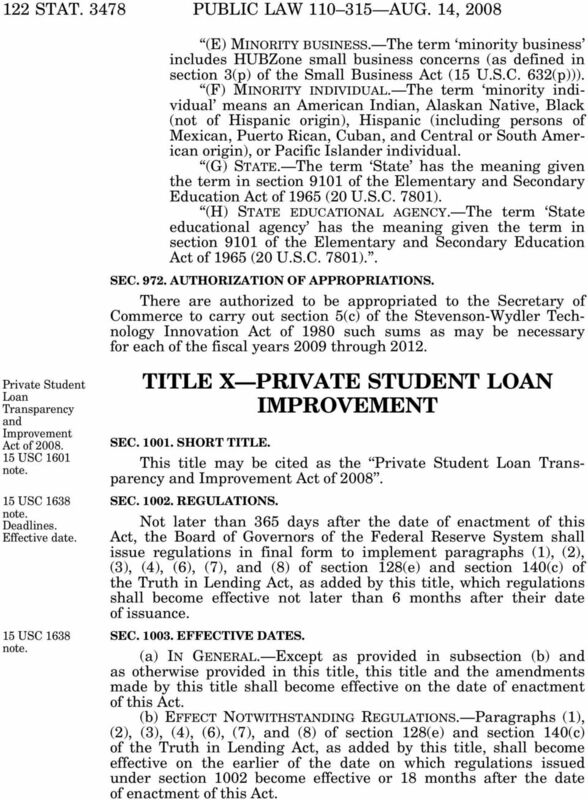 Download "TITLE X PRIVATE STUDENT LOAN IMPROVEMENT"
2 PUBLIC LAW AUG. 14, STAT Subtitle A Preventing Unfair and Deceptive Private Educational Lending Practices and Eliminating Conflicts of Interest SEC AMENDMENT TO THE TRUTH IN LENDING ACT. (a) PREVENTING UNFAIR AND DECEPTIVE PRIVATE EDUCATIONAL LENDING PRACTICES AND CONFLICTS OF INTEREST. Chapter 2 of the Truth in Lending Act (15 U.S.C et seq.) is amended by adding at the end the following new section: 140. Preventing unfair and deceptive private educational lending practices and eliminating conflicts of interest (a) DEFINITIONS. As used in this section (1) the term covered educational institution (A) means any educational institution that offers a postsecondary educational degree, certificate, or program of study (including any institution of higher education); and (B) includes an agent, officer, or employee of the educational institution; (2) the term gift (A)(i) means any gratuity, favor, discount, entertainment, hospitality, loan, or other item having more than a de minimis monetary value, including services, transportation, lodging, or meals, whether provided in kind, by purchase of a ticket, payment in advance, or reimbursement after the expense has been incurred; and (ii) includes an item described in clause (i) provided to a family member of an officer, employee, or agent of a covered educational institution, or to any other individual based on that individual s relationship with the officer, employee, or agent, if (I) the item is provided with the knowledge and acquiescence of the officer, employee, or agent; and (II) the officer, employee, or agent has reason to believe the item was provided because of the official position of the officer, employee, or agent; and (B) does not include (i) standard informational material related to a loan, default aversion, default prevention, or financial literacy; (ii) food, refreshments, training, or informational material furnished to an officer, employee, or agent of a covered educational institution, as an integral part of a training session or through participation in an advisory council that is designed to improve the service of the private educational lender to the covered educational institution, if such training or participation contributes to the professional development of the officer, employee, or agent of the covered educational institution; VerDate Aug :01 Sep 10, 2008 Jkt PO Frm Fmt 6580 Sfmt 6581 E:\PUBLAW\PUBL PUBL USC 1650. 4 PUBLIC LAW AUG. 14, STAT (B) does not include an extension of credit under an open end consumer credit plan, a reverse mortgage transaction, a residential mortgage transaction, or any other loan that is secured by real property or a dwelling; and (8) the term revenue sharing means an arrangement between a covered educational institution and a private educational lender under which (A) a private educational lender provides or issues private education loans with respect to students attending the covered educational institution; (B) the covered educational institution recommends to students or others the private educational lender or the private education loans of the private educational lender; and (C) the private educational lender pays a fee or provides other material benefits, including profit sharing, to the covered educational institution in connection with the private education loans provided to students attending the covered educational institution or a borrower acting on behalf of a student. (b) PROHIBITION ON CERTAIN GIFTS AND ARRANGEMENTS. 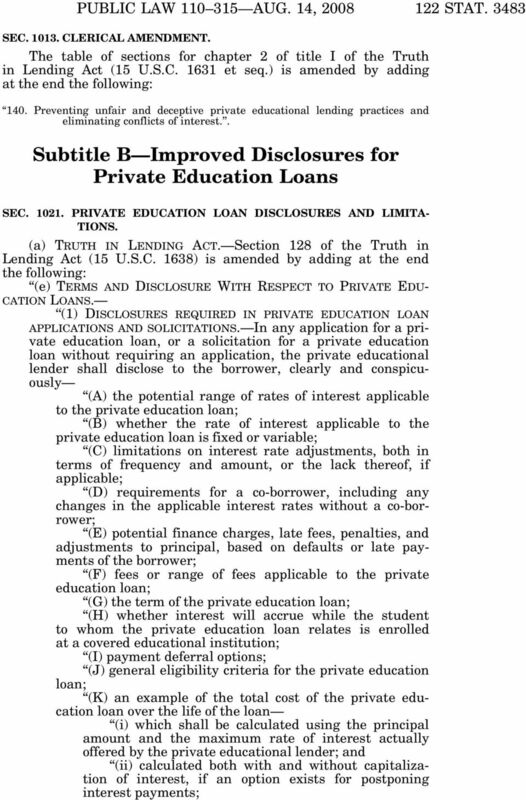 A private educational lender may not, directly or indirectly (1) offer or provide any gift to a covered educational institution in exchange for any advantage or consideration provided to such private educational lender related to its private education loan activities; or (2) engage in revenue sharing with a covered educational institution. (c) PROHIBITION ON CO-BRANDING. A private educational lender may not use the name, emblem, mascot, or logo of the covered educational institution, or other words, pictures, or symbols readily identified with the covered educational institution, in the marketing of private education loans in any way that implies that the covered educational institution endorses the private education loans offered by the private educational lender. (d) ADVISORY BOARD COMPENSATION. Any person who is employed in the financial aid office of a covered educational institution, or who otherwise has responsibilities with respect to private education loans or other financial aid of the institution, and who serves on an advisory board, commission, or group established by a private educational lender or group of such lenders shall be prohibited from receiving anything of value from the private educational lender or group of lenders. Nothing in this subsection prohibits the reimbursement of reasonable expenses incurred by an employee of a covered educational institution as part of their service on an advisory board, commission, or group described in this subsection. (e) PROHIBITION ON PREPAYMENT OR REPAYMENT FEES OR PEN- ALTY. 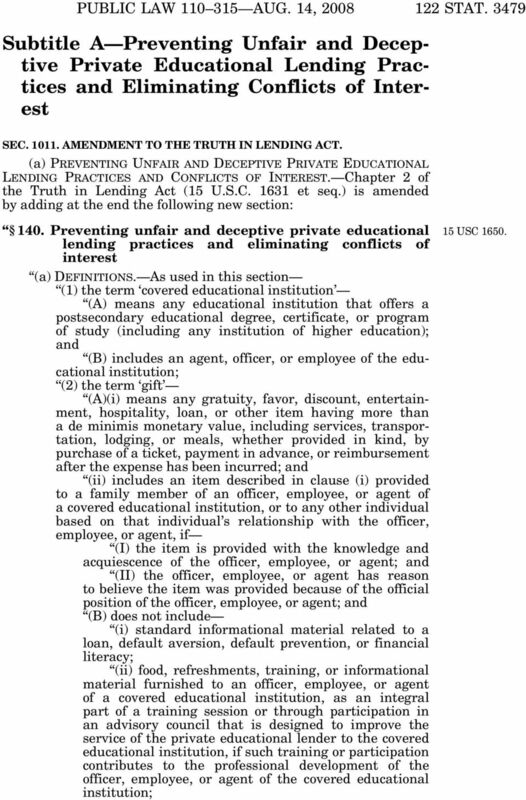 It shall be unlawful for any private educational lender to impose a fee or penalty on a borrower for early repayment or prepayment of any private education loan.. (b) CONFORMING AMENDMENT TO TRUTH IN LENDING ACT. 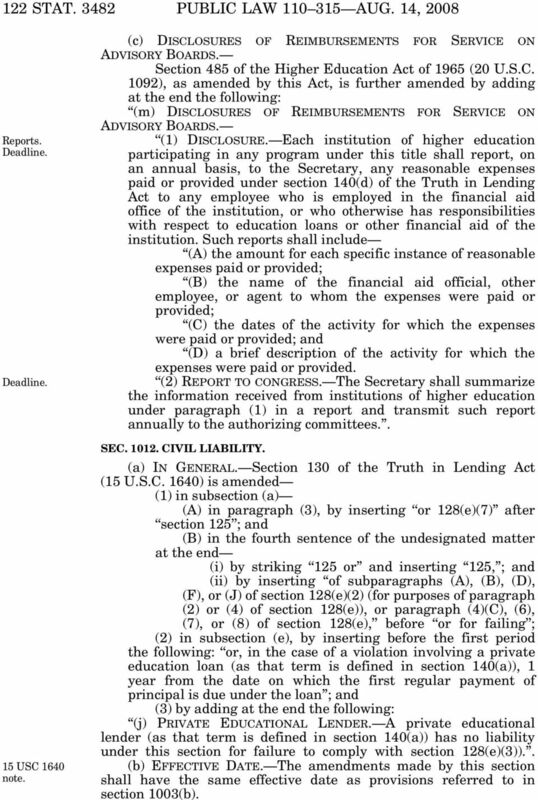 Section 103(f) of the Truth in Lending Act (15 U.S.C. 1602(f)) is amended by adding at the end the following: The term creditor includes a private educational lender (as that term is defined in section 140) for purposes of this title.. VerDate Aug :01 Sep 10, 2008 Jkt PO Frm Fmt 6580 Sfmt 6581 E:\PUBLAW\PUBL PUBL315 Definition. 8 PUBLIC LAW AUG. 14, STAT (G) the maximum term under the private education loan program; (H) an estimate of the total amount for repayment, at both the interest rate in effect on the date of approval and at the maximum possible rate of interest offered by the private educational lender and applicable to the borrower, to the extent that such maximum rate may be determined, or if not, a good faith estimate thereof; (I) any principal and interest payments required while the student for whom the private education loan is intended is enrolled at a covered educational institution and unpaid interest that will accrue during such enrollment; (J) payment deferral options applicable to the borrower; (K) whether monthly payments are graduated; (L) that, as provided in paragraph (6) (i) the borrower shall have the right to accept the terms of the loan and consummate the transaction at any time within 30 calendar days (or such longer period as the private educational lender may provide) following the date on which the application for the private education loan is approved and the borrower receives the disclosure documents required under this subsection for the loan; and (ii) except for changes based on adjustments to the index used for a loan, the rates and terms of the loan may not be changed by the private educational lender during the period described in clause (i); (M) that the borrower (i) may qualify for Federal financial assistance through a program under title IV of the Higher Education Act of 1965 (20 U.S.C et seq. 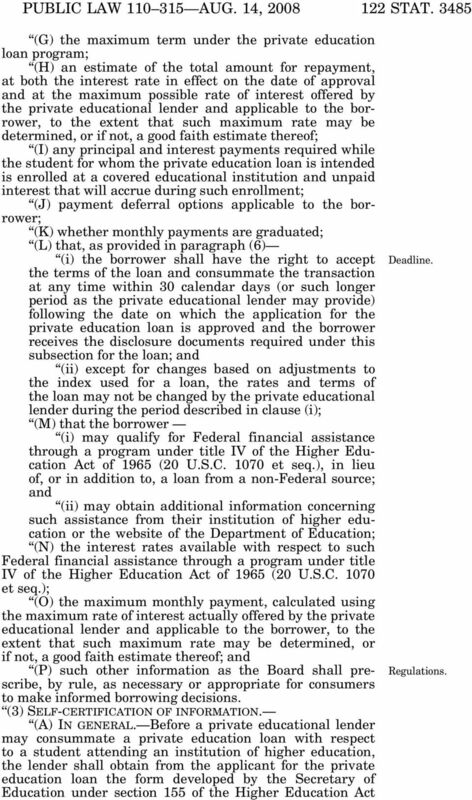 ), in lieu of, or in addition to, a loan from a non-federal source; and (ii) may obtain additional information concerning such assistance from their institution of higher education or the website of the Department of Education; (N) the interest rates available with respect to such Federal financial assistance through a program under title IV of the Higher Education Act of 1965 (20 U.S.C et seq. ); (O) the maximum monthly payment, calculated using the maximum rate of interest actually offered by the private educational lender and applicable to the borrower, to the extent that such maximum rate may be determined, or if not, a good faith estimate thereof; and (P) such other information as the Board shall prescribe, by rule, as necessary or appropriate for consumers to make informed borrowing decisions. (3) SELF-CERTIFICATION OF INFORMATION. (A) IN GENERAL. Before a private educational lender may consummate a private education loan with respect to a student attending an institution of higher education, the lender shall obtain from the applicant for the private education loan the form developed by the Secretary of Education under section 155 of the Higher Education Act VerDate Aug :01 Sep 10, 2008 Jkt PO Frm Fmt 6580 Sfmt 6581 E:\PUBLAW\PUBL PUBL315 Regulations. 10 PUBLIC LAW AUG. 14, STAT (i) the date of acceptance of the terms of the loan and consummation of the transaction by the borrower, as described in subparagraph (A); or (ii) the expiration of the period described in subparagraph (A). (7) RIGHT TO CANCEL. 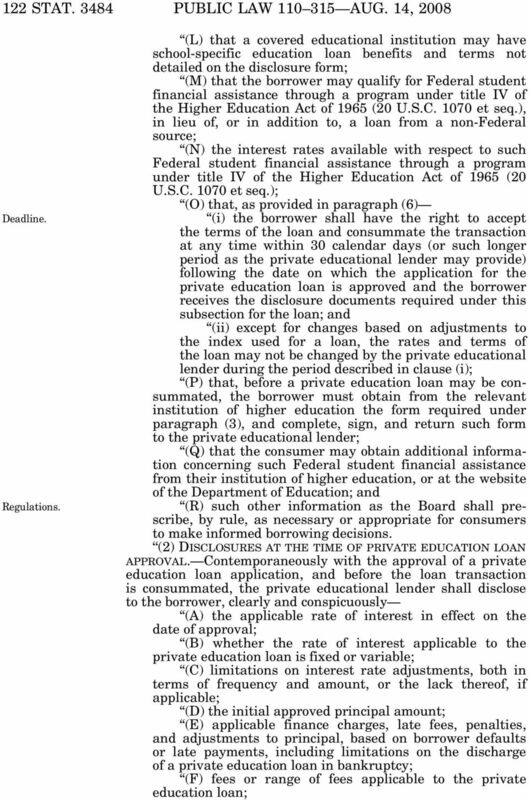 With respect to a private education loan, the borrower may cancel the loan, without penalty to the borrower, at any time within 3 business days of the date on which the loan is consummated, and the private educational lender shall disclose such right to the borrower in accordance with paragraph (4). (8) PROHIBITION ON DISBURSEMENT. No funds may be disbursed with respect to a private education loan until the expiration of the 3-day period described in paragraph (7). (9) BOARD REGULATIONS. 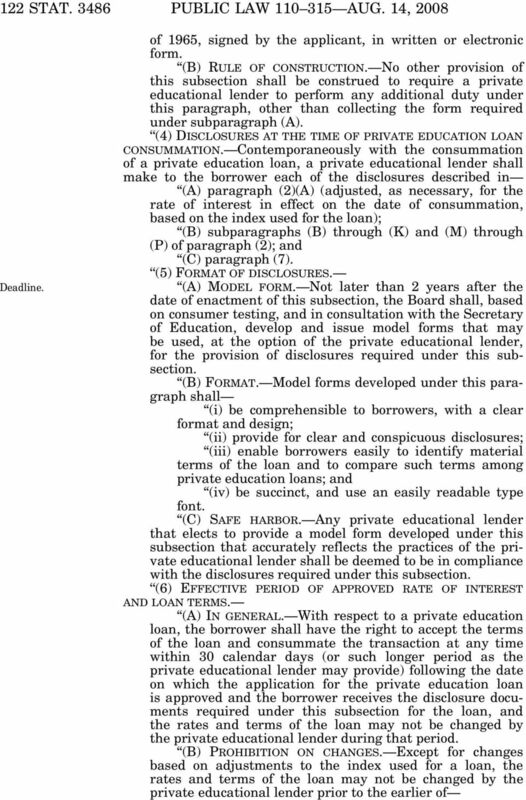 In issuing regulations under this subsection, the Board shall prevent, to the extent possible, duplicative disclosure requirements for private educational lenders that are otherwise required to make disclosures under this title, except that in any case in which the disclosure requirements of this subsection differ or conflict with the disclosure requirements of any other provision of this title, the requirements of this subsection shall be controlling. (10) DEFINITIONS. 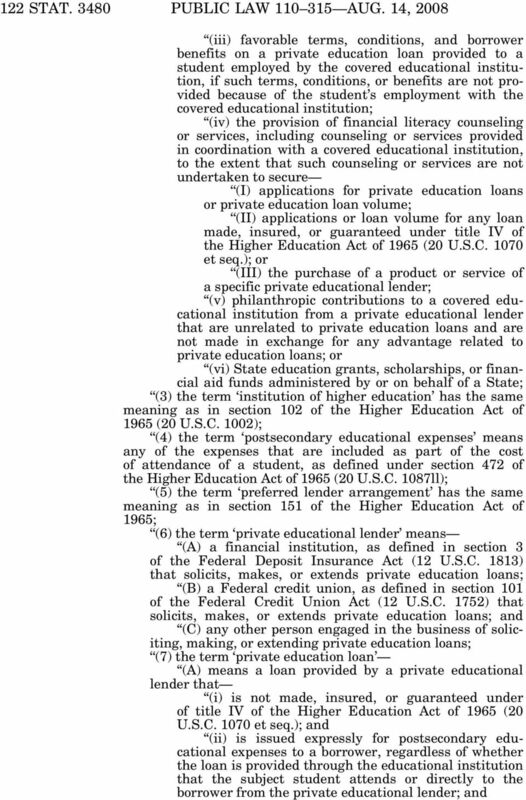 For purposes of this subsection, the terms covered educational institution, private educational lender, and private education loan have the same meanings as in section 140. (11) DUTIES OF LENDERS PARTICIPATING IN PREFERRED LENDER ARRANGEMENTS. 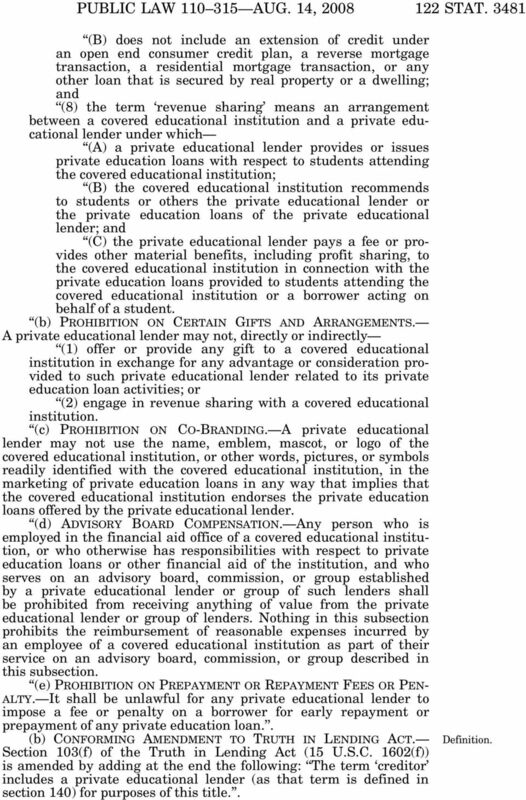 Each private educational lender that has a preferred lender arrangement with a covered educational institution shall annually, by a date determined by the Board, in consultation with the Secretary of Education, provide to the covered educational institution such information as the Board determines to include in the model form developed under paragraph (5) for each type of private education loan that the lender plans to offer to students attending the covered educational institution, or to the families of such students, for the next award year (as that term is defined in section 481 of the Higher Education Act of 1965).. (b) SELF-CERTIFICATION FORM. 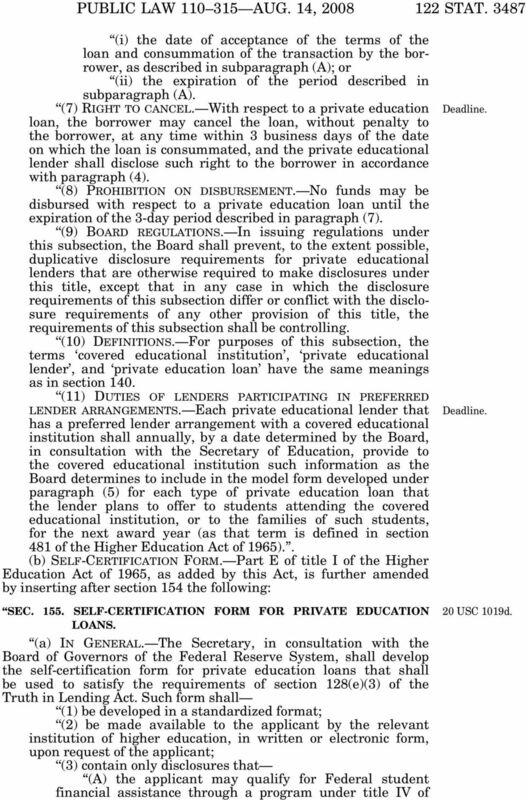 Part E of title I of the Higher Education Act of 1965, as added by this Act, is further amended by inserting after section 154 the following: SEC SELF-CERTIFICATION FORM FOR PRIVATE EDUCATION LOANS. (a) IN GENERAL. The Secretary, in consultation with the Board of Governors of the Federal Reserve System, shall develop the self-certification form for private education loans that shall be used to satisfy the requirements of section 128(e)(3) of the Truth in Lending Act. 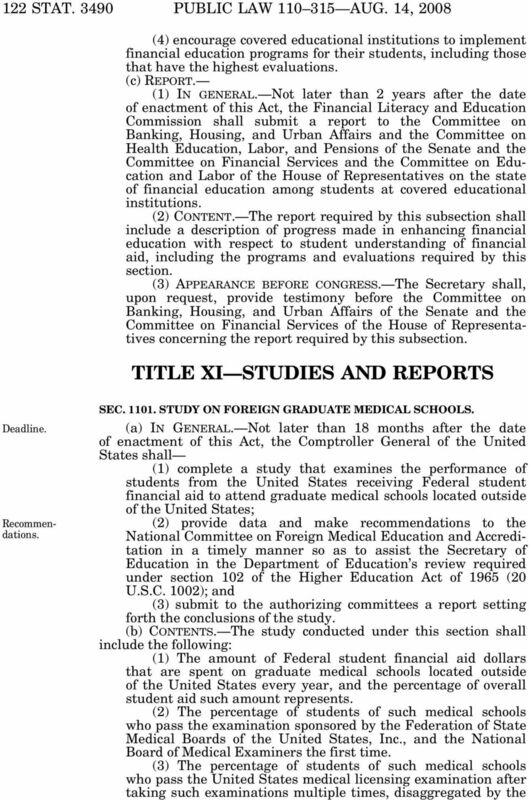 Such form shall (1) be developed in a standardized format; (2) be made available to the applicant by the relevant institution of higher education, in written or electronic form, upon request of the applicant; (3) contain only disclosures that (A) the applicant may qualify for Federal student financial assistance through a program under title IV of VerDate Aug :01 Sep 10, 2008 Jkt PO Frm Fmt 6580 Sfmt 6581 E:\PUBLAW\PUBL PUBL USC 1019d. 12 PUBLIC LAW AUG. 14, STAT section 804(d) of the Community Reinvestment Act of 1977, as added by this section. Subtitle D Financial Literacy; Studies and Reports SEC DEFINITIONS. 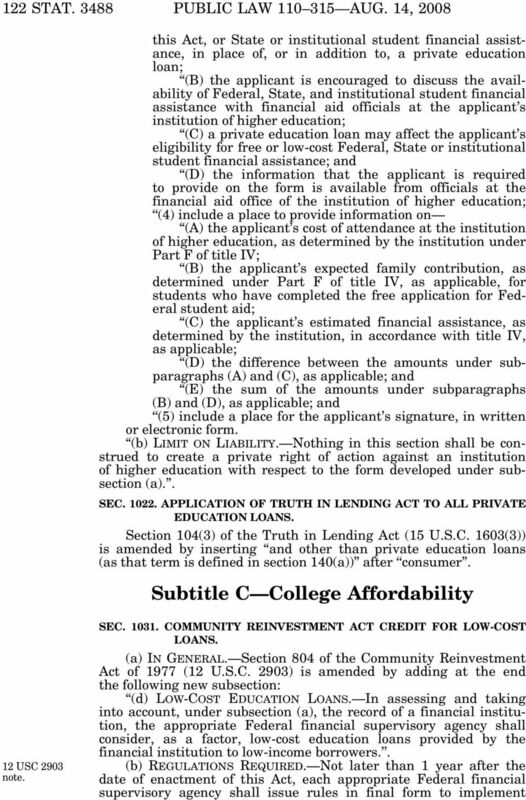 As used in this subtitle (1) the terms covered educational institution, private educational lender, and private education loan have the same meanings as in section 140 of the Truth in Lending Act, as added by this Act; (2) the term historically Black colleges and universities means a part B institution, within the meaning of section 322 of the Higher Education Act of 1965 (20 U.S.C. 1061)); and (3) the term land-grant colleges and universities has the same meaning as in section 1404 of the National Agricultural Research, Extension, and Teaching Policy Act of 1977 (7 U.S.C. 3103). 20 USC 9709 note. SEC COORDINATED EDUCATION EFFORTS. (a) IN GENERAL. 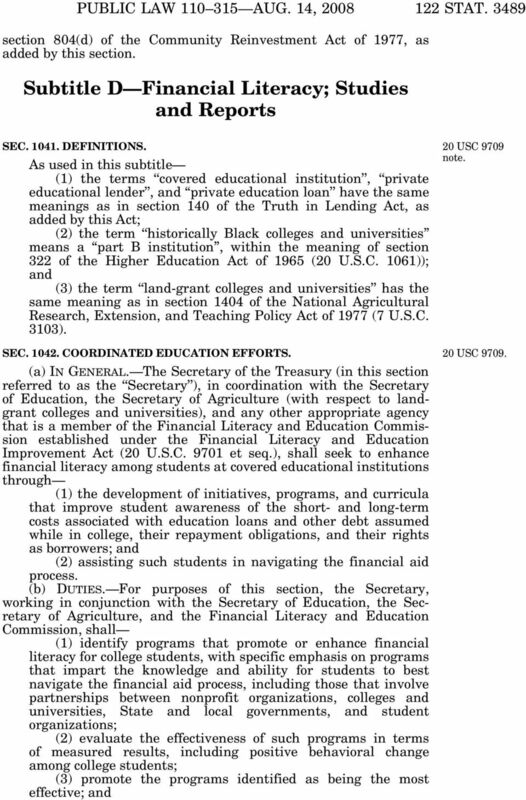 The Secretary of the Treasury (in this section referred to as the Secretary ), in coordination with the Secretary of Education, the Secretary of Agriculture (with respect to landgrant colleges and universities), and any other appropriate agency that is a member of the Financial Literacy and Education Commission established under the Financial Literacy and Education Improvement Act (20 U.S.C et seq. ), shall seek to enhance financial literacy among students at covered educational institutions through (1) the development of initiatives, programs, and curricula that improve student awareness of the short- and long-term costs associated with education loans and other debt assumed while in college, their repayment obligations, and their rights as borrowers; and (2) assisting such students in navigating the financial aid process. (b) DUTIES. For purposes of this section, the Secretary, working in conjunction with the Secretary of Education, the Secretary of Agriculture, and the Financial Literacy and Education Commission, shall (1) identify programs that promote or enhance financial literacy for college students, with specific emphasis on programs that impart the knowledge and ability for students to best navigate the financial aid process, including those that involve partnerships between nonprofit organizations, colleges and universities, State and local governments, and student organizations; (2) evaluate the effectiveness of such programs in terms of measured results, including positive behavioral change among college students; (3) promote the programs identified as being the most effective; and VerDate Aug :01 Sep 10, 2008 Jkt PO Frm Fmt 6580 Sfmt 6581 E:\PUBLAW\PUBL PUBL USC 9709.